1. Is there an easy way to animate a wheel assembly so that it shows at least 360 degree rotation during the animation or more preferably more? I have tried to animate using the Transformation function but this only ends up showing the wheel or gear to rotate very slowly and only through about twenty degrees. There is currently a maximum record-able rotation of 179 degrees in one action. The work around for this is to rotate the wheel 179 degrees, then rotate it 179 degrees again and again etc. When played back this will rotate the wheel the required number of degrees. 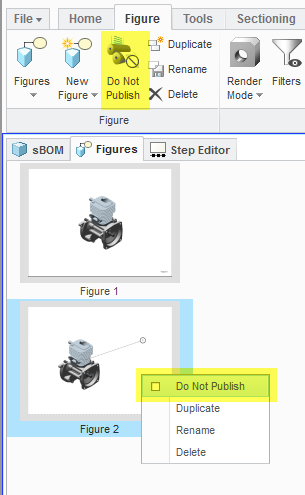 You need to publish the whole illustration for creo view to be able to read it, if you don't want all the figures you can set a figure to not publish. This option is available from Illustrate 3.1. Many thanks for the very fast response! I will try the information that you posted right away.